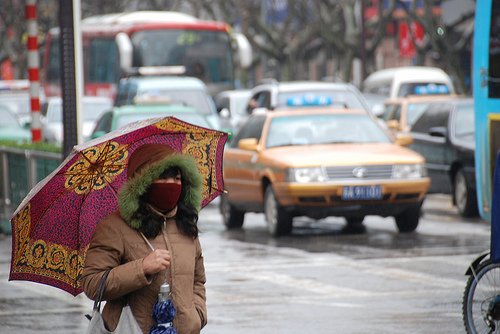 A Nanjing woman protects herself from the rain, the cold, and the airborne particles. Photo by Let Ideas Compete. The new consumption culture has brought western-style affluence that largely rural India can barely cope with. Car sales are growing at 20% a year, but there are not enough roads for anyone to drive on. India – unlike China, Europe and America – does not set any fuel economy standards. The result is that in the backstreets of a city such as Kanpur on the banks of the Ganges sit lines of cars, their engines idling in the sun. Kanpur, with 3 million people, is the world’s seventh most polluted place, according to the World Bank study. A thick brown haze of exhaust fumes is visible at street level. Last year the Guardian found hundreds of people queuing outside the government hospital, their mouths covered with dirty rags. “About 40% of the patients coming with respiratory diseases are affected by the atmospheric pollution,” said Dr R P Singh, who describes the air as a “killer”. See Treehugger for more analysis.